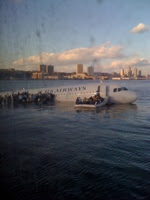 The emergency water landing of US Airways Flight 1549 on New York's Hudson River was successful. All 150 passengers, three flight attendants, and two pilots aboard escaped safely. It is appears to have been the first successful water-landing of its kind by such a large commercial aircraft. Janis Krums of Florida, on a nearby ferry boat, used an i-phone to take the first picture of the water-landing which he posted on flickr. (Krum's website is Janiskrums.com).